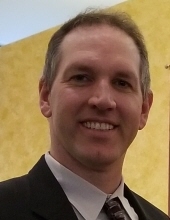 Sean E. Kurzweil, age 46; beloved husband of Stephanie Wasserberg; loving father of Zoe and Aidan Kurzweil; dear son of Breda Deady and the late Edward Kurzweil; fond brother of Stephen (Kim) Cunningham, Joanne Cunningham, Kevin (Kathy) Cunningham, Brian (Marg) Cunningham, and Mark Kurzweil. Memorial Visitation Friday, April 5th, 9:00 a.m. until time of Mass, 10:00 a.m. at St. Mary of Gostyn Church, 445 Prairie Avenue, Downers Grove, Illinois 60515. Interment private. In lieu of flowers, memorials to the American Red Cross, 2200 W. Harrison St., Chicago, IL 60612 or www.redcross.org, appreciated. Arrangements by Adams-Winterfield and Sullivan Funeral Home. 630-968-1000 or www.adamswinterfieldsullivan.com. To send flowers or a remembrance gift to the family of Sean E. Kurzweil, please visit our Tribute Store. "Email Address" would like to share the life celebration of Sean E. Kurzweil. Click on the "link" to go to share a favorite memory or leave a condolence message for the family.